The Galaxy S10 series has been awfully leaky lately, and today that continues with a new leak of Samsung’s lower-cost S10 variant. 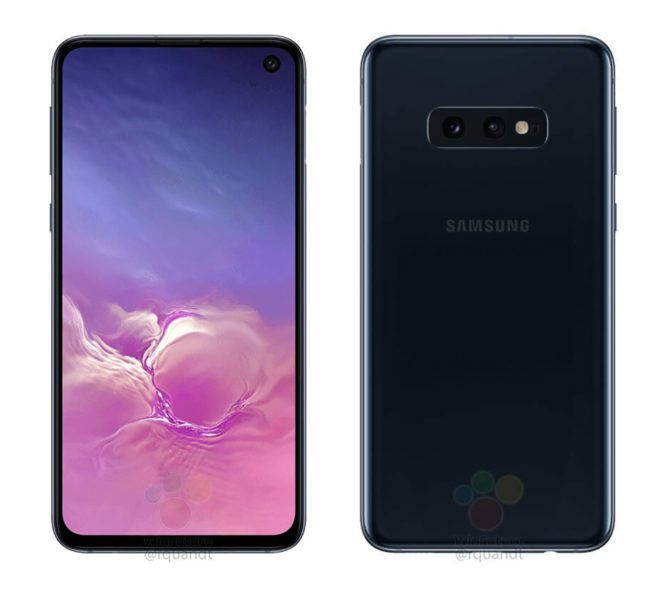 Press renders of the Samsung Galaxy S10E have leaked out. Shared by WinFuture, the images show off the differences between the S10E, the standard S10, and the S10+. The Galaxy S10E appears to have slightly larger bezels than the other S10 models, and the sides of its screen are flat rather than curved like on the S10 and S10+. We can also see that the S10E only has two rear cameras, whereas the S10 and S10+ both have three rear cameras. There are a few other differences with the S10E that aren’t immediately recognizable in these images. The S10E is expected to have a smaller display than the S10 and S10+, with the S10E offering a 5.8-inch screen while the other two have 6.1-inch and 6.4-inch displays, respectively. It’s also said that the S10E does not have an in-display fingerprint reader like the S10 and S10+, instead putting a fingerprint reader in its power button on the right side of the device. Finally, the S10E will reportedly have a smaller 3100mAh battery compared to the 3400mAh battery in the S10 and 4100mAh battery in the S10+. We don’t yet know how much the Galaxy S10E might cost, but it could be an appealing option for folks in the market for a device in the “affordable flagship” category. Not only will it be cheaper than the S10 and S10+, but the S10E is expected to come with the same 6GB of RAM and 128GB of storage as the base Galaxy S10 variant. The S10 is also reportedly getting a bigger screen this year, so the S10E will be worth a look for people who aren’t into phones with screens 6 inches and larger. Now that we’ve gotten good looks at the Galaxy S10E, the Galaxy S10, and the Galaxy 10+, which upcoming GS10 variant are you most interested in? None if the leaked prices are correct. The cheapest one is $850!! dont think so. Someone reply to my one of my post,when the Oneplus6t came out,I wrote now Samsung,Lg,will have lower their prices because now the next time come out with a phone it also be under $600. Someone reply,they read next oneplus come out it will be over $800. OnePlus 7T! I’m not even considering paying Samsung all of that money again! One plus doesnt have nearly ad much features as galaxy phones. Sure it’s good for its price, but you get what you pay for. Not Really in the Samsung your overpaying.. Yes, oneplus brings many features at a decent price point but has a mediocre camera,no wireless charging,unreliable fingerprint scanner &no w ..no water resistant guaranteed. S9=720 or 6t=580..or $25 vs $30.for $5 I’d rather get a more premium experience. $649 and they have a winner. Wishful thinking! No reason to have an in-display fingerprint sensor when they can put it on the side or back. I love my OnePlus 6T but the fingerprint sensor doesn’t always work right; I’d prefer a physical sensor like on laptops or tablets. And the bezels on the S10E look fine to me, at least they’re symmetrical. I never got this obsession with thin bezels anyways.